The First Landing Beach Resort & Villas is a 3.5 star tropical resort that is ideally positioned on the beach of the fabled first landing point for the original Fijian's. This places the First Landing Beach Resort only 15 minutes from Nadi Airport and makes it an ideal place to stay on the Fiji mainland. Built in a magnificent tropical garden setting with majestic palms along the white sandy beach the First Landing Beach Resort is located midway between Nadi and Lautoka, Fiji's second largest city. This quality Fiji accommodation resort is blessed with the only white sand beach in the Nadi area and provides lovely ocean views and breathtaking sunsets across the nearby Fijian islands from the relaxing beach front bures. The First Landing Resort has an all-timber 'plantation style' theme that emulates rainforest villages, making it feel like a tropical paradise. All bures are superbly appointed with high ceilings, polished hardwood floors, designer furnishings and a private, screened verandah. 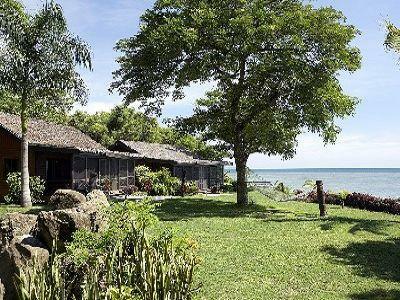 Budget Fiji accommodation in Nadi does not get any better than the First landing Beach Resort. Your stay at the First Landing Beach Resort can be as relaxing or as busy as you like with a host of activities available. Nearby day trips include snorkelling trips to deserted and resort islands, scuba diving to beautiful coral reefs & nearby wrecks, fishing and sailing charters, treks to rainforest and nature reserve parks, visits to the nearby chiefly village of Viseisei and shopping trips to nearby Lautoka and Nadi.